We are all “Called To Create!” The pieces of this banner were created by several SAPUCCers of all ages at the Friday Night Out on November 10th. Then Heather Vietz worked with Dawn Carlson Conn, a liturgical artist, to cut apart the very individual pieces and compile them to create this larger piece of liturgical art. 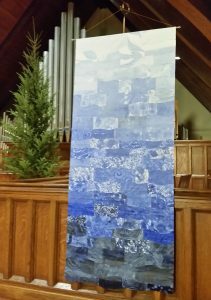 Like the shades of blue in the banner, we experience the movement from darkness to light during Advent as we wait for the birth of the Light of the World, which, for us as Christians, is Jesus the Christ. The wavy lines echo the waters of creation, birth and baptism – the power of being a part of community. This banner will adorn our chancel through the Advent and Christmas seasons. We are beautiful together.